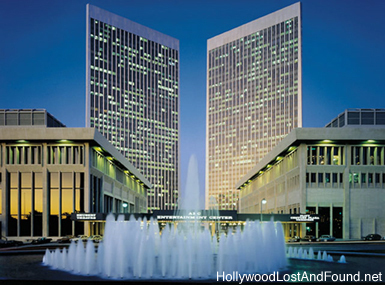 The Century Plaza Towers, located at 2029 and 2049 Century Park East in Century City, California, are the landmarks for a shopping and entertainment complex that includes department stores, restaurants, and multiple theaters. And although many of the present tenants are unaware of it, the space these buildings now occupy was once owned and used by nearby 20th Century Fox Studios. The studio's backlot once filled most of the area, with facades of western towns and foreign city streets. The bulk of the land was sold to developers, who transformed it into the one of the busiest shopping districts. But even now films and television continue to use the location for various productions. "Conquest of the Planet of the Apes" used many of the surrounding shops and buildings throughout the film. And the towers were the location (in establishing footage, anyway) for two famous television detective agencies of the 1980's - The Blue Moon Detective Agency in "Moonlighting" starring Cybil Shepherd and Bruce Willis - and Steele Investigations in "Remington Steele" which starred Stephanie Zimbalist and Pierce Brosnan.